Saturday I was able to go hunting on the opening day of squirrel season. I had scouted an area of Chickahominy WMA and found it full of squirrels. As usual, there were not as many squirrels out when I went hunting them, but I had plenty of action. I learned a ton and am a much better hunter today than I was friday. Chickahominy is an hour and a half from where I live. I got up at 4:30 and headed out so that I would make it there a little before shooting light. I have heard that most of the hunters that hunt at Chick are lazy, so I was also hoping I would be early enough to get to my spot before anyone else did. It turned out that I had nothing to worry about. As far as I could tell I was the first person on the property. The tidbit about lazy hunters turned out to be 100% correct. I spotted the first squirrel of the day about 15 min after sunrise. After a long stalk I spooked it into posted land. I did manage to call it back to me briefly, but I lost it in the thick. This was my first stalk of the year and, being out of practice, I made a lot of mistakes. I hung around the area for about 20 min hoping the squirrel would show itself again, but when it did not I decided to move on. On the way to my next spot I heard a squirrel in a tree about 20 yards from the trail I was on. A quick stalk and a clean shot gave me my first kill of the season. I made a heart/lung shot. I've only put a couple hundred rounds through the .22 magnum I was using and was not confident enough to make a head shot. This was a mistake. The .22 magnum is too much gun for squirrels in my opinion. 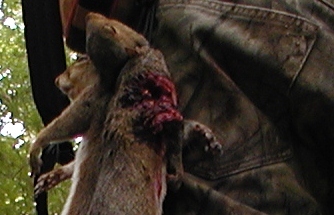 The exit wound was the size of a half dollar with the squirrels lungs literally hanging out. Next time I'm bringing my Benjamin Trail Air Rifle instead. After I calmed down, I still hunted for about another 100 yards. I stopped to check my GPS and when I looked up I saw another squirrel on the ground about 20 yards away. All I could see was its body, its head was behind a sapling. I knew I wanted a head shot, so I sat down and extended the arms of my Harris Bipod. Then I waited, and waited for the squirrel to move, exposing its head. I even made a few barks with my call, but it was still as a stone. Eventually I scooted about three feet to my right until I had a clear head shot. With the bipod I couldn't miss. But I did. The squirrel ran about ten feet to a tree where I took another shot, this time to the heart/lung area. It dropped instantly. The bullet took out its heart and almost nothing else. No waisted meat. Missing while using my bipod told me that my gun had lost zero. It seemed to be shooting a little to the right. Unfortunately, target shooting is not allowed on WMA's, so I had no way of telling for sure. I saw several more squirrels and took one more shot, a 60 yard head shot that I missed. I'm blaming the gun. I should have killed two others, but did not due to my inexperience. After 9:30 I did not see or hear anything else. I headed home at 11:00, tired and happy. I wish I could have stayed all day. I'm sure I would have come close to my limit of six had I been able to hunt the evening. For opening day, on public land, and on a holiday weekend, it was not too crowded. I only saw two other parties. One of which was the greatest example of a bad, lazy hunter I have ever witnessed. I might write an entire blog post on that hunter! I am falling in love with this property. It is the best small game habitat I have ever encountered. However, I haven't seen much in the way of deer or turkey sign, so once those seasons roll around I will hunt elsewhere.